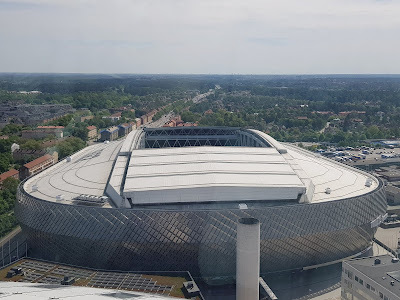 My sixteenth ground of 2018 was on Sunday 20th May at the Tele2 Arena in Johanneshov, Stockholm, Sweden. 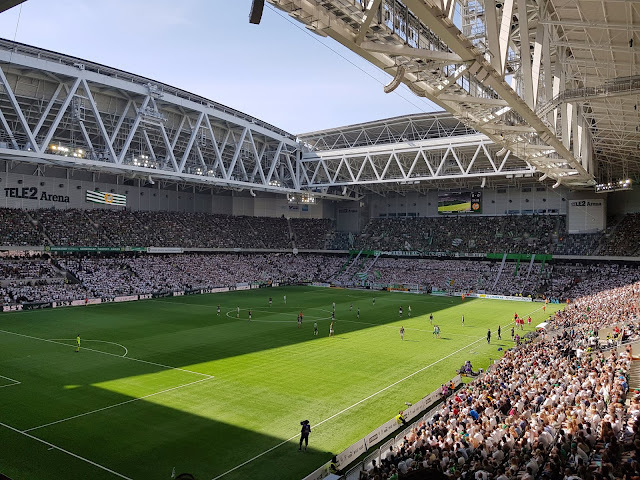 The match was Hammarby vs. AIK in the Swedish Allsvenskan. The Tele2 Arena is located at the southern end of the Stockholm Globe City complex some 3 miles south of Stockholm city centre. The stadium is on an elevated piece of land so has two local roads running underneath eastern and western edges with the main arterial road through Stockholm adjacent on its eastern side. The rest of the western side is taking up by an industrial estate and it is a similar story to the south. To the north lies the rest of the Globe City complex with a shopping centre and three more sporting arenas. The stadium is a few hundred yards from Globen station which is on the T19 Green Line (Metro) and the 22 Line (Tram Network). The stadium was opened in July 2013 and immediately became home to two of Stockholm's biggest football teams - Hammarby IF (who moved from nearby Söderstadion where they had resided since 1966) and Djurgårdens IF (who had been based at Stockholms Stadion since the 1960s). The new 30,000 capacity venue has given both sides around twice the previous stadium capacities they had available to them so this has allowed both to significantly increase their average attendances. Opened in 2013, the Tele2 Arena is the latest addition to the Stockholm Globe City arena and the site's largest venue with it able to hold over 30,000 in sport mode and 45,000 in concert mode. Heading north the other indoor arenas are the Globe Arena, a 16,000 capacity venue which hosts concerts and ice hockey. Built in 1989 it is the world's largest spherical building and has an inclined elevator taking people to the roof to look out over the city. Next to this is a 4,000 capacity concert venue called the Annexet and beyond this the Hovet which was the earliest structure at the site. This 8,000 capacity venue hosts ice hockey and concerts. Hammarby's former Söderstadion used to lie beyond this but was demolished shortly after the side moved to their current home. The Tele2 Arena is a two-tier bowl with a slightly irregular upper tier whereby the amount of seats increases slightly the further north you travel. The lower tier has terracing behind the northern and southern ends as well as the north-west quadrant. 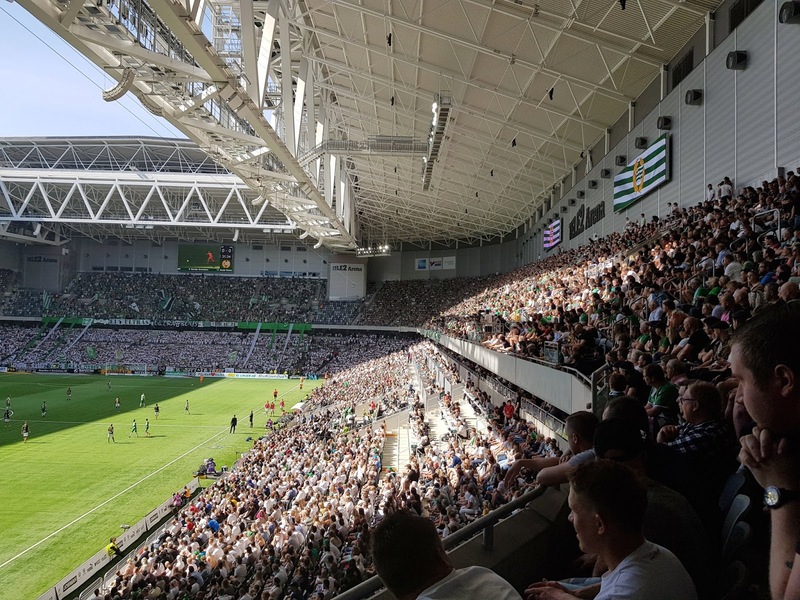 This is aimed at providing a dedicated space for the loudest fans in the stadium with the Hammarby ultras occupying the northern end and the away ultras in the southern end. The dugouts, player tunnel and media section are in the centre of the eastern side and there are hospitality boxes at the back of the lower tier which extend the entire way round the bowl. The upper tier is entirely seating and there are big screen TVs above the seating areas at the back of the northern and southern ends. In each of the four corners there are supports for the retractable roof which can fully cover the pitch to convert the venue into an indoor arena. The design of the roof means when open there is a lot of steel positioned above the spectator areas which helps keep the noise in. With two sets of loud fans for this local derby it meant an excellent atmosphere for the game. 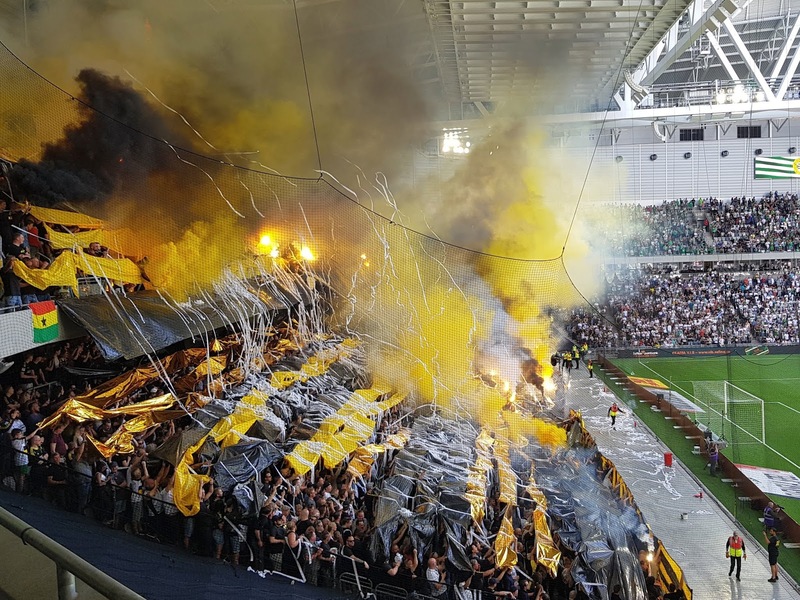 This Stockholm derby was a top of the table clash so it was no surprise to see a sell-out crowd at the Tele2 Arena. The hosts went into the game six points ahead of their city rivals so even at this early stage of the season a win would give them a commanding lead at the top. A win for the visitors and the gap would be down to three points with all to play for. The opening passages of the game were cagey will little attacking play. The first proper chance came in the 27th minute when AIK's Kristoffer Olsson played a one-two with Henok Goitom on the edge of the box and Olsson's low shot grazed the outside of the post. The visitors went close again a few minutes later as more decent interplay saw Nabil Bahoui poke a through ball into the area for Tarik Elyounoussi. Fortunately for the home side keeper Johan Wiland anticipated this and ran out to block the goal bound effort. The next meaningful action came ten minutes after the restart - an AIK corner was mishandled by Johan Wiland and with the ball on its way into the net an acrobatic overhead clearance by Muamer Tankovic saved his goalie's blushes. Not very much happened in the second period but with ten minutes left on the clock the game's key moment occurred. On the far side of the Hammarby penalty area Jiloan Hamad clumsily tangled legs with Daniel Sundgren bringing the AIK defender down. The resulting penalty was coolly dispatched by Tarik Elyounoussi's as goalkeeper Johan Wiland dived the wrong way. 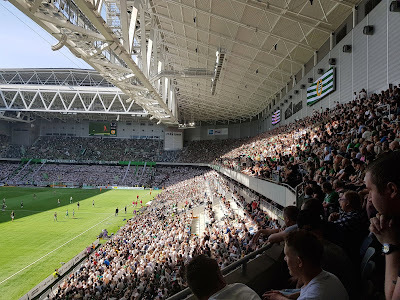 The final minutes saw Hammarby finally go on the attack but the hosts had seemed content with a goalless draw for almost the entire game and it was too little, too late as AIK held on to send the travelling contingent back across the city happy.